This rustic style soup emphasizes simple, yet quality ingredients so get the best possible product that you can find. Prepare a pot of boiling water. 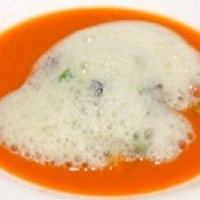 Make an X on the bottom of each tomato and blanch in the boiling water for about 1 minute. Immediately shock in ice water. Remove skins peeling down from the X. Quarter tomatoes, remove seeds, and reserve. Add soybeans to the boiling water and cook until tender but still al dente. Immediately shock in ice water, drain well and reserve. Add potatoes to boiling water and cook until tender but still slightly firm. Immediately shock in ice water until chilled. Cut into 1/2" dice and reserve. In large saucepan, heat the 3 Tbsp. olive oil. Add the onion, celery, and garlic, season with kosher salt and pepper, and saute until the vegetables are translucent, but do not brown. Add the chicken stock, and thyme, bring to a boil, and simmer for 5 minutes. Remove the thyme springs, add the tomatoes, and using an immersion blender, blend the soup until it's relatively smooth but still chunky in texture. Add the edamame and potatoes, and simmer for 5 minutes. Remove soup from heat, and stir in the opal basil. Laddle the soup into soup bowls, and season to taste with the Fleur de sel. 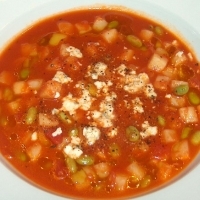 Sprinkle the blue cheese into the soup, and drizzle with the extra virgin olive oil. I love your use of fresh and interesting ingredients --too many recipes here use commercially canned or over-processed ingredients .Good cooking is driven by quality fresh food not the products of factories !